Fast checking of salt levels, cell cleanliness, sanitizer output and water flow. The IntelliChlor IC40 chlorine generator is an impressive system that uses common table salt to produce all the chlorine your pool needs, right in your pool—safely, effectively and automatically. In this article we’ll cover the most important details about the IntelliChlor IC40 and all other related components, as well as technical information and links to manuals. It’s all here! This is your comprehensive guide to the Pentair IntelliChlor system, including information on: IntelliChlor IC15, IC20, IC40, Power Center, acid washing kit and much more. The IntelliChlor IC40 is a very reliable chlorine generator and it’s backed by a generous 3-year warranty for peace of mind. For the purpose of this article I’ll specifically be reviewing the IntelliChlor IC40 but you should know that the IC20 and IC60 models have all the same features — they’re just for larger pools. The specific details for each model are also included in this article. When people speak about owning or wanting a salt water pool, they’re actually talking about owning a chlorine generator, which is exactly what the IntelliChlor IC40 is. How Does Salt Chlorination Work? The simplest way to explain how the IntelliChlor IC40 works is as follows: Essentially, salt (sodium chloride) is added to your swimming pool water (less than a teaspoon of salt per gallon of pool water). As the dissolved salt passes through your generator cell, it is electrolytically converted to pure chlorine, which is then distributed throughout the pool — sanitizing your pool water, keeping it fresh, clear, healthy and safe. There are 4 models to choose from: IC15, IC20, IC40, and IC60. Before deciding on which IntelliChlor model to purchase have a look at the requirements set out by Pentair and make sure you’re purchasing the correct salt chlorine generator for your pool size. Each Pentair chorine generator has a cell hour meter which reports your current usage and will tell you how many hours remain in the life of the IntelliChlor unit. Expect to get about 5 years of use out of your IntelliChlor chlorine generator — it obviously will depend on how much you use it and whether or not you maintain it properly, but, if all goes well, it should last you about five years. TIP: Consider buying the next model up and running it at a lower level. This will ultimately lead to a longer lasting cell. Produces up to 0.60 pounds (272 g) of pure chlorine every 24 hours. For above-ground swimming pools up to 15,000 gallons (56,800 liters). Produces up to 0.70 pounds (317 g) of pure chlorine every 24 hours. For small swimming pools up to 20,000 gallons (75,000 liters). For above ground or in-ground pools. Produces up to 1.40 pounds (635 g) of pure chlorine every 24 hours. For larger residential and smaller commercial pools up to 40,000 gallons (150,000 liters). Produces up to 2 lbs. (907 g) of pure chlorine every 24 hours. For large swimming pools up to 60,000 gallons (227,124 liters). The same sanitation properites as traditional chlorine systems but without the drawbacks. Eliminates the inconvenience of handling expensive chlorine compounds, including: buying, transporting and storing. No odor, stinging eyes or irritated skin. Will save you time and money in the long run. The benefits of the IntelliChlor IC40 is quite simple — it conveniently delivers chlorine into your pool, while producing far less of the irritating chloramines responsible for irritated skin and eyes. Chloramines are also the reason for the chlorine smell that we’re all familiar with. The IntelliChlor IC40 also has a water softening effect by reducing dissolved alkali minerals in your swimming pool. The IntelliChlor IC40 is a smart decision for a lot of reasons, but especially if you, or anyone in your family has chlorine sensitivities. Chlorine is an irritant that removes your natural oils, which is the reason why people with sensitive skin are more susceptible to irritation. And the reality is — salt water is far more natural, and closer to the environment that we started with in the womb. The Pentair salt chlorine generator will cost you less to maintain throughout the year as salt is much cheaper than chlorine. Now, how much cheaper buying the IntelliChlor IC40 is over the long-term really depends on many factors. You can expect to get (on average) about 5 years of use from your salt cell, so do the math. How much do you spend a year on chlorine? Multiply that 5 to determine if you’ll save money. But you will definitely save time — as well as having much healthier water to swim in for you, your family, and friends. Now this is what I call a swimming pool. The quality of water in your swimming pool will be healthier, more natural and non-irritating. Convenience. It’s far easier to keep your water fresh. The IntelliChlor does it all for you. Thankfully, the IntelliChlor IC40 monitors your chemistry, allowing you to easily make adjustments when necessary. Later in this article you can see the control panel layout. How does IntelliChlor IC40 work? Unlike traditional chlorine additive systems where chlorine has to be constantly added; with the IntelliChlor IC40, salt is recycled continuously, every day, minimizing pool maintenance and simplifying the process. The chlorine generator automatically keeps itself clean with a built-in reverse cycling feature that helps prevent scale build-up adding to a longer cell life. Having said that, you’ll have to check your cell every couple months. If there’s excessive scale forming between the plates or debris is present, you’ll need to clean the cell manually, either by using high-pressure water from your garden hose or using the IntelliChlor acid washing kit, which I’ll cover later in this article. 7 x 17 x 7 inches. Lighter than it looks — weighs under 8 pounds. The IntelliChlor Electronic Chlorine Generator (IECG) salt chlorinator uses a process known as electrolysis to produce chlorine gas which immediately dissolves into a solution to create Hypochlorite and Hypochlorous acid pool and spa water sanitizer from a low concentration of salt added to the pool water. Hypochlorite and Hypochlorous kill bacteria, oxidizes organic material, and kills algae, then reverts back to salt. The IECG then reuses the salt and the process starts over again. The IntelliChlor system is comprised of the IECG and Power Center. You’ll notice that the IntelliChlor IC40 has a control panel with buttons and LED indicators to control the IECG and produce chlorine. The unit measures both the water temperature and salt level in order to create chlorine at the defined output. The control panel provides you feedback if your water chemistry is incorrect. For example, if the salt level in the pool water is too low (red on ‘salt level’ display) and consequently, the cell is turned off until you add salt to the swimming pool. The IntelliChlor IC40 has a self-cleaning cycle which reverses cell polarity, reducing calcium buildup and ultimately keeping your unit functioning efficiently. This feature turns the cell off and on regularly in order to reduce calcium and scale buildup. This self-cleaning feature is essential to the longevity of your IntelliChlor chlorine generator. Detailed image of the control panel layout. The IntelliChlor IC40 contains the control electronics and bipolar electrodes that electrically produces chlorine when energized with DC current. Chlorine production can be adjusted by either changing the sanitizer output level on the control panel and/or by modifying the amount of hours the chlorine generator is on each day. You’re in control. Every few hours, your IntelliChlor IC40 will automatically reverses the cell electrode blades to help clean the electrolytic cell. This process takes place behind the scenes and does not interfere with the production of chlorine. It’s quite clever and well-engineered. Creating chlorine from salt is a complicated process but the technology that Pentair has designed is excellent and easy to use. You don’t have to be a genius to maintain a healthy pool if you own the IntelliChlor IC40. The chlorine generator also contains a mechanical flow sensor that measures water flow; constantly checking to see that the correct amount of water is passing through the cell to allow chlorination to occur. The IECG automatically measures water salinity and temperature. The control panel displays three (3) salinity ranges via the LED indicators. The IntelliChlor IC40 includes a 15-foot UL approved four conductor 16-gauge cable for connection to the Power Center. Different configurations of the IntelliChlor Chlorine Generator. Flow Sensor: The flow sensor ensures that the proper amount of water will flow through the IntelliChlor IC40. If the IECG is not properly set-up and/or does not receive adequate water flow, no chlorine will be produced. Temperature Sensor: Your IntelliChlor IC40 will be turned off if the temperature of your swimming pool water falls below 52° F, ±3° F (11° C, ±1.67° C). This is to protect your unit from potential damage. In this case, the “Cold Water” light will be ON and all chlorine production will stop. Salt Sensor: Two (2) salt sensor probes within the IntelliChlor IC40 are activated every time the IECG is turned on and then consistently every 12 hours of continuous running. During those times when the salt sensors are operational, the salt level LED indicator lights will flash in a scrolling sequence for two (2) minutes to let you know that the IntelliChlor IC40 is in analysis mode. After two (2) minutes, the LED indicators lights will signal one (1) of three (3) salinity ranges. For more detailed information on the sensors what they mean read the USER / INSTALLATION GUIDE. To see how much salt you need to bring your swimming pool to the ideal salinity of 3,400 PPM use the Salinity Calculator from Pentair. 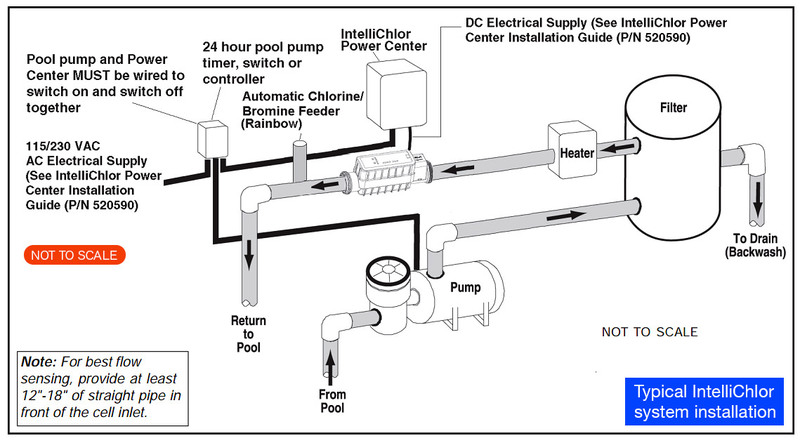 If the IntelliChlor IC40 is installed on a pool/spa combination system, make sure you install (see diagram below) the chlorine generator BEFORE the pool/spa return valve to allow the correct amount of chlorination for both your pool and spa, and also to avoid creating gas traps in the pipes. CAUTION: To avoid permanent damage to the IntelliChlor cell, your automatic in-line chlorine/bromine feeder (such as the Pentair Rainbow) MUST be installed AFTER the IntelliChlor IC40 cell (as shown below). When using the IntelliChlor IC40 with an in-floor cleaner pressure system, it is recommended that you have a separate return line for your cleaner to reduce the increased water pressure stress on the IntelliChlor IC40 cell. View or download the INSTALLATION & USER GUIDE (English) — IntelliChlor IC40. View or download the INSTALLATION & USER GUIDE (Spanish) — IntelliChlor IC40. View or download the QUICK START GUIDE — IntelliChlor IC40. View or download the BROCHURE 1 — IntelliChlor IC40. View or download the BROCHURE 2 — IntelliChlor IC40. NOTE: If this is a new pool set-up then you’ll need the IntelliChlor “dummy” bypass cell (520588), which is also covered later in this article. There’s a lot of technology packed in this small chlorine generator. Captures all performance data every day: (production settings, hours of operation, chlorine output, cell cleaning cycles, salt readings, and water temperature averages). Automatic shut-off feature protects chlorine generator and prolongs cell life under low water temperature conditions. Cell hour meter reports current usage to determine how many hours remain in the life of the unit. On-time cycling prevents calcium and scale build-up to extend cell life. Superior design combines cell and control panel as one assembly. Cell blades are made from a titanium metal base and coated with precious metal Ruthenium oxide. Cell blades are capable of producing chlorine for at least 10,000 hours, when the IECG is used properly. The IECG can be installed horizontally or vertically. Separate Power Center mounts to wall at equipment pad, for easy AC wiring. Electronics run cool for long, reliable life. Head Loss of the IECG system installed into the main line is less than 1 psi. Salt level LED indicators show three ranges for the amount of salt in pool. Red and green LED indicators show system status for water flow, cell status and cold water. MORE and LESS output buttons control how much chlorine is produced. BOOST cycle sets the unit to maximum chlorine output for 24 hours of pump run time. UL listed to UL1081 standards for swimming pool chlorinators. Approved NSF regulatory standards, and CE certified. Chlorine output: 1.40 lbs every 24 hours (635 gm/24 hours). Output: 22-39 VDC @ 6amps maximum from the power center. Includes salt cell with 2″ unions. Titanium electrode cell blades coated with Ruthenium oxide for durability. Visit the Pentair site if you want to contact them directly, or visit the PoolFYI.com forums to learn from other customers and pool owners. Is the IntelliChlor IC40 Right For You? The IntelliChlor system makes owning a pool much simpler. Well, it’s a fairly simple answer as to whether or not you should upgrade your pool to a salt water system. The short answer is: Yes! The overall water quality that the IntelliChlor IC40 produces is excellent and far superior to any traditional chlorine system. Water quality should be your number one reason for upgrading, otherwise why own a swimming pool if your water quality is poor? The second reason why the IntelliChlor chlorine generator is a good idea is the amount of time and energy you’ll save in pool maintenance. Once the cell is installed and setup all you have to do is monitor it and clean it every couple months. The upkeep is minimal — far less than having to constantly replenish your chlorine levels the old-fashioned way. Now, I know the initial cost is expensive. Let’s face it, it’s costly. But in the long run the costs actually even out as you won’t be paying for expensive chlorine. If you can afford it without breaking the bank then I definitely recommend the upgrade. It truly is an excellent product designed for ease of use, but most importantly, to give you healthy water to swim in. It’s not just about the monetary cost in my opinion — it’s about creating a healthier swimming environment for you, your family and friends. The choice is ultimately yours! If you or anyone in your family has any chlorine sensitivities then this is a must buy item. If you’re not comfortable installing the IntelliChlor chlorine generator then please hire a professional to do it for you, otherwise you only have a 60 day warranty if something goes wrong. One (1) Year Warranty if Installed by Pool Professional, Sixty (60) Day Warranty if Installed by Non-Professional, see Owner’s Manual for a full description of warranty claims and coverage details. If you’re unsure if this is the right chlorine generator for you then you may also want to consider the Hayward Salt Cell. Stand-alone installations require a power center (PN 520556). The Pentair IntelliChlor (520556) Power Center provides power and control communication to and from the IntelliChlor cell. It’s compatible with: IC20, IC40 and IC60 IntelliChlor. NOTE: Stand-alone installations require a power center (PN 520556). required to produce chlorine. The power supply is connected with the pool circulation pump electrical source so that the IntelliChlor chlorine generator only operates when the pool pump is turned on. You should mount the Power Center vertically on the wall — no more than 15feet away from the chlorine generator. The Power Center contains the transformer, fuse, connector to the cell and the AC electrical current wiring configuration with the DC electrical current output cable to the IECG. A fuse holder is mounted on the bottom of the Power Center for additional protection. There are no other controls or lights on the Power Center. View or download the USER GUIDE for the IntelliChlor Power Center. Pass-through cell for winter or start-up. This Dummy bypass cell is compatible with all Pentair InterlliChlor salt chlorinators (IC60, IC40, IC20, IC15) and also with Pentair EasyTouch pool and spa automatic control systems. Designed as a pass-through cell for Winter or start-up. The purpose of this product is to prevent debris from entering the IntelliChlor Electronic Chlorine Generator. It is recommended that the IntelliChlor Electronic Chlorine Generator “dummy” cell be installed before installing the IntelliChlor Electronic Chlorine Generator. After the pool system has flushed the debris from the pipes, remove the “dummy cell” and install the IntelliChlor Electronic Chlorine Generator. Fits Pentair InterlliChlor salt chlorinator sanitizers models: IC60, IC40, IC20, IC15. Also fits Pentair EasyTouch pool and spa automatic control systems. Measures: 4″ diameter x 17″ long. The kit includes: One o-ring, one washer, and one cap. The IntelliChlor electrolytic cell must be acid cleaned if excessive scale formation between the plates or debris is present. The kit includes: One o-ring, one washer, and one cap. This is an absolute must have item since there’s no other way to safely clean your IntelliChlor cell. It’s a shame that Pentair doesn’t include this with your IntelliChlor IC40. That’s the number one customer complaint about the Pentair IntelliChlor Acid Cleaning Kit. Other than that, it’s an excellent product that you need to buy in order to clean your electrolytic cell. View or download the MANUAL for the Pentair IntelliChlor Acid Cleaning Kit. Remove your IntelliChlor unit from the pool system plumbing. Install the acid cleaning kit on the IntelliChlor unit. Mix one quart of muriatic acid (Hydrochloric acid) with one gallon of tap water in a five (5) gallon plastic bucket. Always add acid to the water, never add water to the acid. Always wear eye protection and use rubber gloves. Make sure you’re working in a well-ventilated area. Place the cell vertically in the bucket with the cap end down. Carefully pour the acid solution into the cell until the blades are just covered. Allow the acid solution to bubble, and to clean the blades. The acid should only be contained in the cell and not around it. A foaming action will begin, which is caused by scale (calcium carbonate) being dissolved from the plates. If you don’t see rigorous foaming action then it means that the IntelliChlor cell does not need to be cleaned (STOP THE CLEANING PROCESS – go on to step 5). Otherwise, allow the cell to remain in the solution until the foaming has stopped. However, do not leave in acid for more than 1/2 hour. Excessive Acid Washing will damage your electrolytic cell. Pour the acid solution back into the five gallon bucket. Rinse the cell thoroughly with clean tap water and inspect. If deposits are still visible, repeat the process: pour the acid back into the bucket and carefully pour the acid solution into the cell until the blades are just covered. You may need to add more acid to the solution. Rinse the cell again with clean tap water and inspect. If clean, replace the cell and resume normal operation. by an authorized IntelliChlor service representative for excessive hardness and/or improper water balance. If no scale or debris deposits are observed in the cell after two bi-monthly inspections, it is not necessary to continue bi-monthly inspections. However, due to possible changes in pool water chemistry and filtering effectiveness, it is recommended that the cell be removed for inspection at least twice a year. parts can be used again for future IntelliChlor cell cleaning. Using the two unions, install the IntelliChlor unit into the system plumbing, connect the communication cable to power or load center, then switch the pump on. Recommended for above ground pools up to 15,000 Gallons. The Pentair IntelliChlor IC15 is a salt generator for above ground pools up to 15,000 gallons. This chlorine generator is unique from the other cells (IC20, IC40, IC60). This model has its own User Guide, whereas the other models share one manual. It may be installed either horizontally or vertically with 2 threaded couplings and is built with a clear sliding cover for easy access to diagnostic readings. ensures the IECG and pool pump will switch on and off together. When the IC15 (IECG) is installed in Europe, IC15 (IECG) power supply fuses should ONLY be obtained from the manufacturer. WARNING: The IC15 Power Supply is only intended for use with the IC15 cell. Do not plug any other IntelliChlor cell into this power supply. Severe damage will result. View or download the USER / INSTALLATION GUIDE for the IntelliChlor IC15. For above ground pools up to 15,000 gallons. Connects to 2 inch PVC piping. Cell blades are capable of producing chlorine for at least 10,000 hours, when the SCG is used properly. The SCG can be installed horizontally or vertically. IC15 produces up to 0.278 kg of chlorine per day. Head Loss of the SCG system installed into the main line is less than 6.9 kPa (1 psi). The IntelliChlor IC20 is the economical choice for smaller pools up to 20,000 U.S. gallons (75,000 liters). It produces up to .70 pounds of chlorine every 24 hours. The IntelliChlor IC60 chlorine generator is designed for pools up to 60,000 U.S. gallons (227,124 liters). The cell will produce the equivalent of 2 lbs. of pure chlorine per 24 hours of continuous pool pump run time. Sloping Sides: Multiply total liters by 0.85 = liter capacity.